Good day, guys! (Actually, not a good day, because it's two weeks and Empire of Storms STILL isn't out! 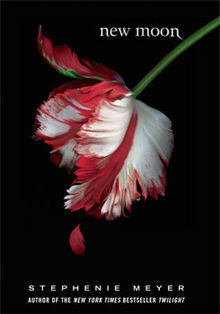 *tantrums*) So, today, I shall be reviewing Stephenie Meyer's New Moon, the sequel to Twilight, which I had reviewed weeks ago. The story starts out well, with Bella's constantly urging Edward to turn her into a vampire, of course. But then everything changed when the fire nation attacked Edward abruptly decided to leave Bella. ON HER BIRTHDAY. And leaves no trace of him from before. (Dammit Edward!) The mood set right after was devastating, I could relate to Bella's torment—little did I realize that I longed for Edward to come back. Oh yeah, and that eight pages showing the months that pass. That was ingenious. And then suddenly... a wild Jacob appeared—completely yet conveniently replacing Edward's stature in the novel. Jacob gets super chummy with Bella. First impression? Jacob's turn. The Cullen family was absent from the whole novel until like what—Page 320? Last impression? Definitely Jacob's turn. Of course, there were at least some throwbacks to Bella's gone-forever boyfriend with hallucinations. But that didn't really make up for anything at all. Don't get me wrong; I don't dislike Jacob as a character (only his abrupt, convenient entrance)—he's far greater than Edward's (and Bella's) OCD-esque behavior. I like how Jacob treats Bella like Bella instead of his own personal brand of heroin. I mean, Bella's fawning over Edward was alright in the first book, tolerable even. But come on, it didn't have to be repeated again and again. I get it: he is beautiful, his skin is cold and rigid, his eyes are charming. But then another problem arises: this obviously means this novel was trying very hard to form a love triangle. After around 200 pages of going steady with Jacob Black, Edward Cullen decided to show himself again after a misunderstanding that Bella had died. The climax where Bella ventured to Volterra, Italy to save Edward (that's a change!) for once, that was awesome! I was so darn glad Edward returned. But then, Jacob was left behind and then his importance was thrown into the dustbin. Really? Who should I be rooting for now? Edward or Jacob? The ending was short-lived, though. But it ends with more trouble than ever. Love triangle included. Honestly, to really make up for the abrupt leaving of the Cullens and the abrupt coming of the Blacks and the Uley pack, the ending should've been more detailed. But yeah, overall, this book is okay. The first one was much, much better. I just feel as if New Moon is more or less a "filler" part of the series, with complicating matters and Jacob's turn to hit on Bella, and all that. I'd still continue reading the series. Hopefully, I won't be a tad disappointed in Eclipse. But I have to wait... unfortunately, my English teacher isn't here at the moment. Anyway, I think I'm going to go do some writing. Catch you guys later! Thanks for reading my review!